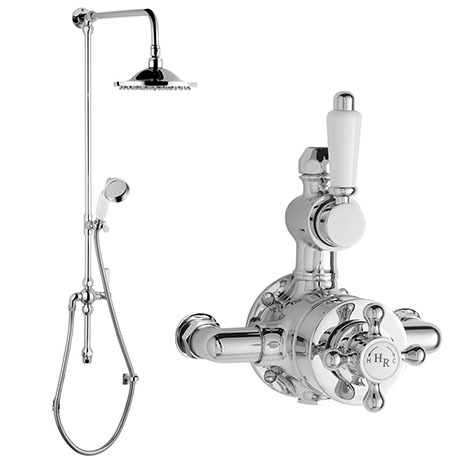 Hudon Reed Traditional Twin exposed 3/4 inch thermostatic valve with 18mm diameter grand rigid riser kit and shower rose. The turn of the century evokes a feeling of greatness, an era when engineeing was the world's driving force, and this sense of achievement is replicated in our collection of traditional styled showers. Suitable for all types of plumbing installation this shower valve has the added safety benefit of a built in anti scald device should the cold water supply fail. It has a built-in diverter so as to switch between the fixed head or hand held shower.